Even though your competitor knows your UserID and Password they still can’t login! Every device has it’s own device management tool (Blackberry, iOS, Android) Single Management Console to control the entire mobile access. The biggest question mark on giving mobile access to your employee should be: If your employee can access our email and intranet from their smartphone / tablet, how can we assure that your competitor can’t? MDM is the perfect solution to answer this kind of question, because it is based on provisioning and personalized invitation which pairs the UserID with Device Credentials. Therefore, no device can’t get into your system, unless the device is invited and has been provisioned to an employee profile in your company, this mechanism is called Mobile Access Management (MAM). However, today Mobile Access Management alone is no longer enough, consumer demand for Bring-Your-Own-Device (BYOD) is now requiring a greater security standard since employers have evolving expectations on the type of restrictions that should be applied to mobile devices. 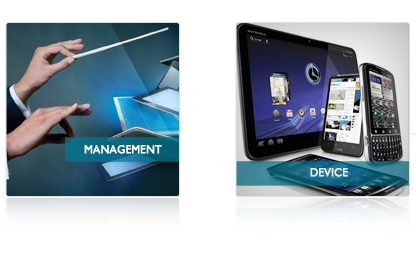 Mobile Device Management (MDM) is a way to ensure employees stay productive and do not breach corporate policies. By controlling and protecting the data and configuration settings for all mobile devices in the network, MDM can reduce support costs and business risks. The intent of MDM is to optimize the functionality and security of a mobile communications network while minimizing cost and downtime. MDM is usually enforced for corporate owned devices, while MAM is usually offered to employee owned device. Both solution give protection to corporate data. Global Innovation Technology is the authorized reseller for IBM MaaS 360, Oracle Mobile Security Suite (OMSS), and NetIQ Access Manager.